I began pursuing my Ham Radio License in 1976 while stationed in California and successfully passed my Novice class license with the help on an older licensed local ham, or commonly known in the Ham Radio circles as "Elmer". I've made many worldwide contacts since those early days and I would like to take time to share my interest with you on what is considered by many as a lifelong hobby. Take a brief tour of some of the radios that I've had the pleasure of using on My Ham Radio History Page. 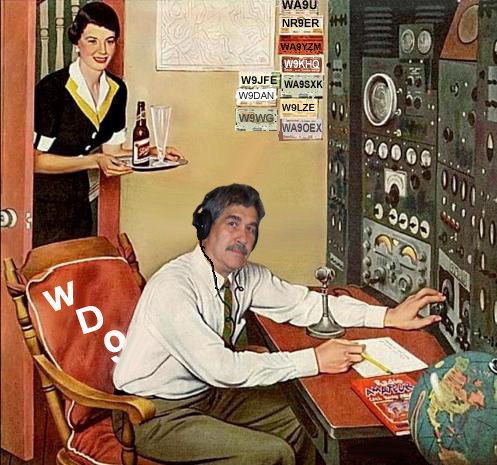 My interest has taken my hobby into combining radio, computers, and the internet. I've managed to now combine video into the hobby with the W9FE LiveStream HamCam. I currently use a Icom IC-7300 driving an Alpha 78 amplifier. Here is the complete 1986 AS-2259/GR Training Manual TM11-5985-379-14P (NSN 5985-00-106-6130) for this antenna. I also use an Icom IC-718 into a Huster 5BTV Vertical antenna for my digital contacts on SSTV, PSK-31, Olivia, JT65A, JT9, and FT8. Need a DMR Codeplug for our St. Louis Area DMR repeaters? These web pages are provided as a public service by . They are intended to be used by the public for viewing and retrieving information only. Please feel welcome to use the site for the intended purposes and let me know if you have suggestions for improvement. Unauthorized attempts to upload or change information on these pages or this web site are strictly prohibited and may be punishable under the Computer Fraud and Abuse Act of 1986 or other appropriate laws. Thank you very much for your compliance. Copyright ©, 2007, all rights reserved. Duplication of any of these pages in any form without the express permission of the owner is strictly prohibited.